The Cardinall's Musick are on quite a trajectory at the moment, just recently their discs, which have always been excellent, have suddenly moved up a notch into quite astonishingly exciting territory. This could be inspired by their move to the Hyperion label or equally it could simply be the coming-of-age of a well-established vocal ensemble. This offering of works by Hieronymus Praetorius (who, incidentally, had a son called Michael – but not the Michael Praetorius) has a distinctly Christmassy scent about it thanks to Joseph, lieber Joseph mein and In dulci iubilo on the last track and because of this it is well timed for the festive season and beyond. Quite often I find that programmes with a lot of overtly happy choral music can be hard to stomach, but this disc has none of that sickly sweetness because the music allows time for reflection too. At first glance this is rather an adventurous programme for just eight singers, especially in the double choir pieces that are normally sung by larger choral forces, but The Cardinall’s Musick sing with panache. Hearing this music sung one voice per part made me reflect on how much I dislike the tendency that the larger choral affairs have to sound like old stereophonic demonstration records. One could argue that without a bigger choir some of the majesty is stripped from the Magnificat settings but I’m not convinced since what we have here is an invitation to glimpse more closely within the texture and that brings a certain majesty all of its own. We have on this disc the eight singers who constitute the main core of The Cardinall's Musick, eight singers who have been singing and recording together for a long time, and it shows. This is probably part of the winning formula that their director, Andrew Carwood, has designed since The Cardinall’s Musick perform with an understanding that is fast becoming their greatest asset. Whereas the UK’s choral scene often relies heavily on it’s faultless sight-reading , this disc, I am pleased to say, is an honorable exception as one can clearly hear this is a well-rehearsed and passionate ensemble and as a result, they are a pleasure to listen to. There are just one or two unpolished moments if you listen very closely; a bulge in the texture here and there or a slightly unconvincing entry at the beginning of the last Magnificat but I fully applaud the decision to leave these well alone, they are a touching hint of human fallibility and, besides, over-editing in this repertoire always leads to a greater loss of musicality. This is a disc of adult singing rather than one of those faultless ‘Urtext’ recordings, and I loved it for that and on this note I must give special mention to the two sopranos who work together beautifully. They seem to have made quite a brave decision to sing out in fuller voices over the last few recordings the have made together and I’m so grateful that they have done this. I don’t want to imply in any way that their singing is inappropriate to the repertoire for they are in perfect control and there are no overly operatic moments. What I’m really getting at is that this is a refreshing change, I feel like they have thrown off the detached air that often characterizes performances of this repertoire and have fully devoted themselves to the music which makes for an exhilarating performance. 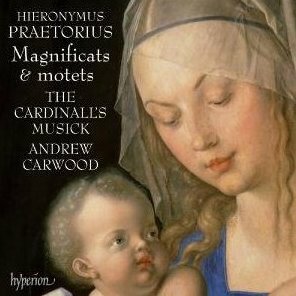 My one gripe, if it can be called that, is that whilst The Cardinall's Musick are making beautiful discs like this one of Praetorius (and Schütz is coming soon according to their website) they are noticeably not getting on with the Byrd Edition, which for addicts like me is exceptionally frustrating. The next Byrd installment is not out until February which is a huge gap when you consider that the last one came back in November 2006. It seems a shame that releases should have to be staggered like this, but then I expect this is due to market forces rather than music ones.